Food is central to our lives in Scotland – from what we eat and drink as individuals, to the number of jobs in the growing food and drink sector, and the links between its production and distribution and our environment and communities. With the Scottish Government committed to making Scotland a Good Food Nation, Scotland’s relationship with food and drink came under the spotlight at an event in the Scottish Parliament on 5 September 2018 looking at our food future. Chaired by Claudia Beamish MSP, this seminar used Nourish Scotland’s vision of a sustainable food system in 2030 to kick-start a discussion on food in Scotland: what we produce and how we produce it, what we consume and how we consume it, and what kind of future we would like. With expert input from a panel featuring Cate Devine, freelance food writer, Pete Ritchie, executive director of Nourish Scotland, Sarah Millar from the Soil Association, and Dr Wendy Russell from the Rowett Institute, the debate covered a wide range of issues, with questions on the future for our farms, local food systems, nutrition, food waste, imports and exports, veganism, the role of public procurement, food poverty, and need for social innovation. Pete is executive director of Nourish Scotland, an NGO that campaigns on food justice issues and has published a “Food Atlas” that maps out a sustainable food future. He was a member of the Scottish Government’s Food Commission, and he runs Whitmuir Organics with his partner Heather Anderson. Pete’s presentation was on Scotland’s future food system. Wendy is a natural product chemist who researches how plants keep us and our planet healthy. She is the lead for gut health at the University of Aberdeen Rowett Institute, and was named as Food and Drink Scientist of the Year in 2017 at the Food and Drink Federation awards. Wendy presented on behalf of SEFARI (Scottish Environment, Food and Agriculture Research Institutes) on the current research into sustainable food production. Cate is a freelance food journalist who has covered developments in food and drink for over 25 years in both print and broadcast media. She spent more than 19 years with The Herald, and was the restaurant critic for Scottish Field magazine for five years. Sarah is a member of the Scottish Government’s National Council of Rural Advisers. As agricultural development manager for the Soil Association, she works with farmers on sustainable farming, and she is also vice-chair of the Next Generation Committee of NFU Scotland. To begin, Pete outlined some familiar themes that he was not going to cover, starting with technology. We know that technology will change our food system: robots will pick strawberries, drones will check livestock and driverless vans will deliver from small farms and large corporations—indeed, that is happening already. He would not focus on our growing understanding of animal cognition, the extraordinary things we are finding out about animals, the increasing popularity of veganism and what he called “peak meat”—the point after which meat consumption stops growing and starts to decline. He would not cover trends in population and yields—he said there is plenty of food for all if we want that, except in the event of severe climate change or nuclear war. What did that leave for discussion? Plenty, as it turned out. Pete gave a brief run-through of possible future trends. If the future looks like the past 12 years, the production of beef, lamb, pork, chicken, potatoes and caged eggs will decline; the cereal crop yield will stay flat, and most cereals will still go to feed or alcohol; the production of vegetables, fruit and free-range eggs will increase a lot; and farmed salmon and milk output will increase a little. Nitrogen and pesticide use will stay the same; the number of waders will decline and the number of seed-eating birds will increase; obesity levels will stay the same, as will fruit and veg consumption; food insecurity will increase, and more of us will eat alone. He suggested that Scotland’s food culture currently lies somewhere in the middle of those stereotypes, and emphasised that we must start from where we are. He argued that we cannot understand Scotland’s food without understanding Scotland’s “ridiculous” apportionment of land; the distortion of world food production by the British Empire; our history of urbanisation and the clearances; issues of gender; and diversity in our diet and our landscapes. He went on to note that, as hospitality is at the heart of food, it is worth talking about how we as a society do hospitality. Pete questioned the framing of the current debate, in which an us-and-them approach runs deep. He decried the virtue signalling around food and the toxic discussions that can develop. Pete claimed that, while we import and export a lot of food, we do not connect with it well, and less so than in a lot of European countries, let alone other countries around the world. Indeed, Scotland is almost uniquely disconnected from its food. While “Ambition 2030”, the Scotland Food & Drink strategy for growth, aims—in Pete’s words—to double everything, he argued that that should be only part of the plan. He suggested that a better plan would be to read across the United Nations sustainable development goals in all that we do on food. In particular, he stressed that the sustainable development goals are about the sort of economy that we want, rather than aims to be pursued in spite of economic imperatives. He noted that the First Minister was one of the first world leaders to put those goals at the heart of what Scotland does and tie them into the National Performance Framework. end hunger and malnutrition. One in 10 children in Scotland is growing up in a food insecure household, while 200,000 children live in households that cannot afford the diet that the Eatwell Guide recommends. reduce premature mortality from non-communicable diseases. Action on this goal is crucial, given that 65% of Scots are overweight or obese and 5% are living with diabetes. ensure that women participate fully in the sector and can take up leadership opportunities. As the latest progress report from the Women in Agriculture Taskforce reminds us, women are much less likely than men to be involved in decision-making at the industry’s highest levels. improving water quality by reducing pollution. At present, only 62% of our water bodies are ranked as good quality, which is not quite good enough; the deficiencies can be largely ascribed to rural diffuse pollution. increasing diversification in food and farming, and the need to upgrade and innovate in the realm of technology. decoupling economic growth and environmental degradation. There has been progress, but Scotland needs to go further in that respect. building sustainable food cities. It is important that we build connections between our cities and our peri-urban and regional areas. Scotland has the beginnings of a land use strategy, but we could go much further to develop bespoke solutions. He accepted that Scotland does care about the goal of halving waste throughout the supply chain. However, we waste a third of our food, and although a target has been set, there is no clear plan as yet. Finally, Pete noted that we are trying to integrate climate change measures into our policies and planning in all our sectors. Nonetheless, we have a lot more work to do in order to integrate ecosystem and biodiversity values into our national accounting system and to change our accounting models to reflect the need for sustainable development. As a caveat, Pete admitted that people who talk about the future often get it wrong. He cited the famous Aliens advert for Smash potato powder and pointed out that, conversely, Mash Direct in Northern Ireland now exports fresh mashed potatoes direct to the United States and Dubai. To conclude, he declared that if we want food 2030 to be better than food 2018, we have to join all the dots. Where do we start in thinking about a diet for 2030? In order to reduce meat consumption, Scotland will need to develop sources of sustainable protein. Wendy emphasised the changing patterns of meat intake around the world. While the global population doubled between 1950 and 2000, meat intake increased fivefold. By 2050 there will be at least 9.1 billion people on the planet, making global meat intake unsustainable. Consumption has increased even in countries such as India, where meat intake has historically been lower. look at underutilised resources, including high-protein agricultural crops such as fava bean, buckwheat, hemp, pea and lupin. SEFARI’s research programme has studied how those crops could be integrated into the supply chain and how their consumption might be increased. It has also looked at novel technologies for developing food formulations in order to promote dietary diversity. consider making further use of agricultural waste streams. As a Zero Waste Scotland report has noted, these are already well valorised, but they could be put to better use if protein becomes scarce and prices go up. The food processing industry also produces a lot of waste, and SEFARI has worked closely with companies such as Kettle Produce, Speyfruit and Supernature to identify some of those waste streams. It also works with organisations like Eat Balanced on integrating them with processed foods. explore the possibility of growing more wild species such as gorse, broom, vetch, bracken, fireweed and buddleia on marginal land. These crops require minimal energy inputs and contain natural pesticides, and they are very effective at scavenging nutrients. They are not only high in protein, but rich in bioactives and high in phytochemical compounds. That could help to reduce non-communicable diseases, which have increased the further we have moved from our traditional diets. Wendy stressed that wild species should not necessarily be eaten now, but they would be an option if protein became scarce. Wendy emphasised that these are challenging times for food production. Our food system has to change, and we have to work across all sectors in order to make that change work. How do we increase dietary diversity as we look at food for the future? The SEFARI strategic research programme is providing the science to underpin the possible solutions to some of those questions. In a wide-ranging discussion, the participants picked up on several of the themes highlighted in the presentations. 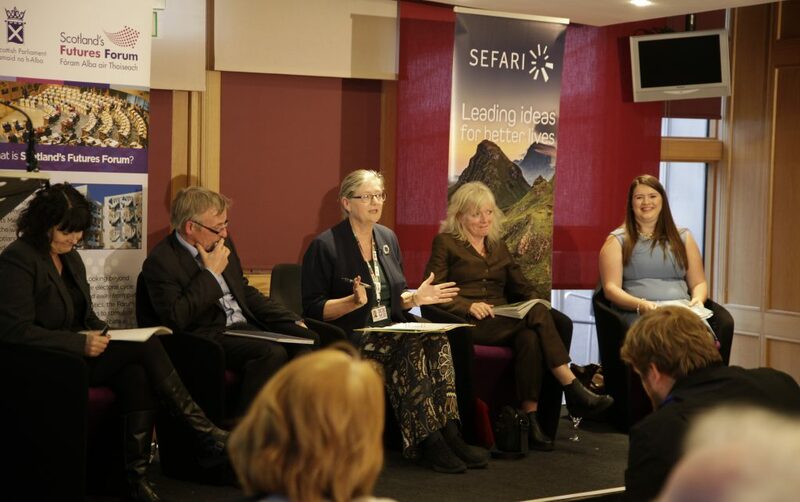 By the end, the conversation had come full circle, returning to how we build a food culture, which served to emphasise the interconnected nature of the various challenges involved in developing a coherent vision for Scotland’s food system as we move towards 2030. The discussion kicked off on a positive note, highlighting the vibrant and interesting food culture in Scotland. However, it was argued that, despite a massive change for the better, our society still does not value food enough, with queues outside bakers that sell unhealthy pies and pastries the norm. Education was suggested as an answer, not only to improve public health and reduce disease—as Wendy highlighted in her presentation—but to enable people to eat their way to a better landscape and benefit society as a whole. Initiatives already under way in Scotland, such as community gardens and education sessions with Glasgow’s MasterChef winner Gary Maclean, were cited as a helpful way forward, but it was also suggested that we might seek to learn from what other countries are doing well. The importance of consultation in building a better food culture was stressed, but it was recognised that people need to be informed in order to contribute. This observation led to a debate about the need for more holistic education in schools on the food system and the provenance of what we eat. However, while the idea of using education to motivate and inspire young people to work in agriculture was welcomed, issues around land reform were cited as a possible barrier that could prevent them from actually getting involved. It was suggested that the connection between consumer and producer was currently broken, and that a new social contract was needed. It was emphasised that producers are at the heart of the food system: without producers, we will get nowhere. Although connections are important, it was suggested that farmers had a responsibility to look at themselves and think about what they might do differently. Two areas in particular were cited as possible arenas for change. The first was land use. It was claimed that 80% of arable land is now used to grow cereals for the animal feed and whisky industries, which presented issues for food production. It was suggested that farmers might branch out into diverse areas of production such as new proteins. However, it was stressed in response that Scotland’s £4.5 billion whisky industry is a huge success story that shouldn’t be undermined. It was admitted overall that there are no easy answers, although it was suggested that Brexit might be a motivator for change in some respects. Again, in discussing possible solutions for the future, participants stressed the need for consultation with citizens on land use, although it was once more noted that people must be informed about the issues if they are to contribute to the debate. It was also suggested that farmers could be solution makers for society’s problems in the areas of animal welfare and the environment. It was noted that the public has a strong interest in animal welfare, and that farmers should consider whether they are proud of what they do in that regard and if not, they should change their practices. It was pointed out that, for better or for worse, farmers shape the landscape and can contribute to sustainable development in the context of the UN goals that Pete summarised earlier. Moving from producers back to the consumer, the importance of affordability was raised as a key concern in the wider food debate. It was stated that the first duty of a country is to feed its own people well, and that the prevalence of food poverty in Scotland needs to be challenged and addressed as part of any long-term strategy. It was argued that we need to improve nutrition among hard-to-reach demographics, and that food must be cheap but healthy. While it was noted that some people could barely afford to eat anything, let alone healthy food, it was countered that food is now the cheapest it has ever been. The participants discussed available solutions and considered what Scotland can learn from elsewhere. Food waste was highlighted as a possible area that could be linked with the need to address food poverty through valorisation, as it was asserted that plenty of food waste is fit for human consumption. However, this view provoked a strong reaction in some quarters; it was stressed that the two issues should never be confused, and that providing some citizens with second-class food was simply not an option. A change in procurement policy was suggested as an answer, as was growing more food at a local level; it was pointed out that the Community Empowerment (Scotland) Act 2015 places a duty on local authorities to prepare a strategy in that respect. In addition, the emergence of social enterprises such as the Locavore Grocery in Glasgow was highlighted as a positive trend, and there were calls for the promotion of healthy eating through workplace canteens and student accommodation, which brought the discussion back to the importance of developing a strong food culture in Scotland. In closing, the debate touched on some of the broader issues facing Scotland, such as Brexit, and the need for a legislative commitment and strong leadership from government. The status of proposals for a Good Food Nation bill was discussed, and there were pleas to move this higher up the Scottish Government’s agenda. It was asserted that, if anybody can do this, we can, and that when it comes to food Scotland can show the way to 2030 and beyond. The seminar is part of the Futures Forum’s Scotland 2030 Programme, a session-long exploration of Scotland’s culture and society in 2030. For more information about the programme, click here.